You can read all about us in our About page. For now, suffice it to say that we’re as objective as can be when we review sewing machines. We’re not affiliated with any brand, and we don’t receive any free sample machines to bias us one way or another. Instead, we approach every machine as passionate needleworkers and total sewing nerds! Here on our homepage, we’ve rounded up our favorite all-around performers. We’ll introduce them to your in our in-depth reviews, and give you some advice on finding your perfect machine in our buying guide. Of course, sewing is hardly a one-size-fits-all pursuit, as any seamster or seamstress knows! That’s why we’ve also created lots of specific guides for things like quilting, embroidery, and other more specific needs. You’ll find our special guide for beginners, our favorite kids’ models, and much more. Let’s put the pedal to the floor and get going with our Top Three all-time favorite models! To come up with just three recommendations for the best sewing machines on the market right now was a tough proposition indeed! There are hundreds of models out there, and while we’re as picky as can be about handing out “great” labels, it’s hard to get the market down past 20 standout models without leaving a few winners behind. While we absolutely love Brother machines for quilting, for instance, we wouldn’t use many of them for leatherwork. Likewise, there are some absolutely fantastic quilting machines on the market, but they’re not what we’d recommend for folks who want to try fancy embroidery work. With that in mind, we’ve included all our various favorites in our more specific guides, and tried to narrow down the field to the best all-purpose options for the general needleworker here on our homepage. Below, you’ll find in-depth reviews of our Top Three. We’ve picked a model for beginners and budget-shoppers, a model that we think is ideal for intermediate needleworkers and passionate hobbyists, and one premium model for a working pro or other demanding hand. After our main reviews, we’ve included a few “see also” mentions that we think it would be wrong to leave out. They’re the best place to look if you’re looking for our absolute cheapest and absolute nicest recommendations, or for our favorite “old-school”, all-manual pick. Now that we’ve got all that out of the way, let’s meet our favorite all-purpose sewing machines! This Brother is actually the most popular machine on the market right now! Unlike a lot of other best-selling models we’ve come across, though, the cs6000i deserves its marketshare. It’s user-friendly, packed with features, and surprisingly hardy for the ~$150 price range. We think it’s an excellent first machine for beginners, or an affordable choice for experienced folks who don’t want to spend too much money. It’s light and compact. If you don’t have a dedicated workstation, or if you’re trekking to classes, this is a great option. It’s easy for people of all ages to lift and it’s compact enough to get in the car or cupboard without any trouble. It’s surprisingly powerful for an inexpensive, light machine! This one has no trouble seizing up on thicker materials, and it can handle larger projects without issues. As long as you get the right needle and speed pairing, it’s perfectly capable of stitching layered denim and other tough materials. That’s not the case with most machines at this price, especially the computerized models! The computer comes pre-loaded with 60 different stitch options, including some decorative options. There are specific choices for quilting, monogramming, and other more specialized tasks, as well as all-purpose stitches. There are stitch diagrams right on the front of the machine, so you don’t have to scroll through menus or consult the manual to find the one you want. The simple display is easier to navigate than a lot of larger computers, too! The motherboard also stores stitch patterns for 7 different styles of buttonholes, and all of them require only one step! It’s an extremely user-friendly workstation. Bobbin threading is a piece of cake, thanks to the jam-resistant, quick-set bobbin system. That’s one of our favorite Brother features. You don’t have to fish for bobbin threads, and it makes one of sewing’s trickiest bits simple and easy for any skill level, with helpful diagrams printed on the machine. It’s very easy to switch feet as well! That’s a heck of a lot of value for something in the $150 range! You have all the feet and needles you need for most projects right out of the box. Plus, having an extension table and spring-foot make this much more suitable for budding and budget quilters than other inexpensive models. 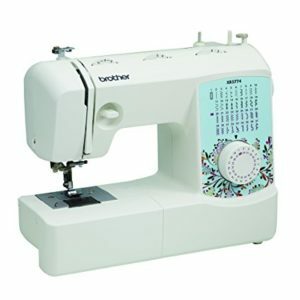 Whether you’re a beginner who wants a machine with room to grow or an experienced needleworker who wants something inexpensive and versatile, the Brother is extremely well-equipped. It’s also refreshingly easy to pack away! Aside from the table and case, you can store all your accessories in the arm of the machine. Since you have a hard case right from the start, this is also a perfect machine for bringing to classes or storing securely in closets. The stitch selection and width adjustments are all digital, with simple up and down arrow controls to make adjustments. You also have a slider to adjust the stitch speed on the machine itself. Foot pedals at this price aren’t the most sensitive (including the Brother’s) , so that’s a nice override to have to hand. It comes with both a foot pedal and a push-button sewing mode. You can stop and start stitches using either input mechanism. We love that you can choose what’s best for you, or use the pedal at home and the buttons on the go! It lasts a long time if you’re careful to follow the machine, and follow instructions before you start sewing. Even if you’re experienced, you should absolutely start by reading through the whole manual and trying each function, since it doesn’t work like other machines. Most issues are totally avoidable as long as you take the time to get to know your machine! Plus, if you don’t read the manual, you might miss out on the Brother’s smart features under the hood, like setting a personal top speed for stitches, and doing other customizations that will make the machine more pleasant for you to use! It comes with a 25-year warranty, and lifetime phone support. Since it’s computerized, this isn’t a good machine for beginners to learn technique with. If you’re getting into needlework for the first time and would rather develop your skills before you take computer shortcuts, have a look at the Janome Magnolia below! However, if you want to jump right into creating and mending, you’ll love the Brother! Brother machines have factory-set tension. If you have issues, there’s not an easy way to make manual tweaks. That’s one of the downsides of computerized models in general. If you’re coming from another machine, the automatic needle-threading feature can take some getting used to. Thankfully, if you haven’t used another make or model before, you won’t have anything to un-learn! 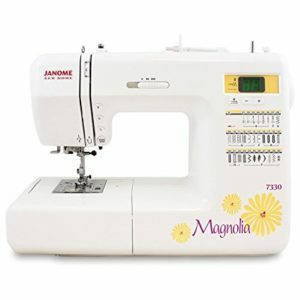 If you’re the sort of person who gets frustrated by computer systems, you’ll want to steer clear of the Brother and go for a Janome Magnolia. It’s very user-friendly, but you can still run into problems. For folks who have had one machine for years and are migrating to the Brother, we do have one warning: but if you don’t take the time to get to know the machine or make some changes to the way you work, you can get into trouble with broken parts and lots of frustration. Trust us–it’s worth tweaking your workflow slightly up front, because modern machines like this one have a lot to offer in the long run. Like a lot of cheap machines, it has a mixed reliability record. The Brother does have a lot of plastic parts, and it’s not the most rugged machine on the market. We’d recommend going with some additional warranty coverage at the checkout. In most cases, problems with these machines are down to either user error or quality control. Quality control is one weak point on these, so test yours out of the box and be sure to inspect it carefully before your return window is up. 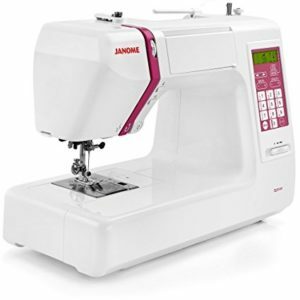 Our middle recommendation for the all-around best sewing machine on the market is the Janome DC5100. It’s our choice for intermediate and advanced home needleworkers. This Janome has many advantages over the Brother above. 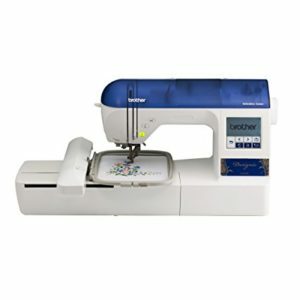 It has more built-in stitches, intuitive customization features, and the ability to save your custom stitch settings. Plus, it’s built in such a way that it sews more smoothly, more reliably, and with exceptional durability. Even though it’s aimed at more experienced needleworkers, it offers all but the most advanced users room to grow! Like the Brother above, it’s computerized. The Janome has a fast, adept onboard computer which gives you lots of versatility and convenience. At the same time, it has rugged construction that totally outclasses anything else at this price or below it. We think it’s an ideal balance between modern convenience and classic construction quality! While this isn’t technically classed as an industrial or heavy-duty machine, it’s very durable. You can feel the difference between this and a machine like the Brother at first touch. It’s heavier, to start. It’s also much quieter, and it has no wobbles in the frame as it works. Overall, the Janome is very reassuring, where the Brother is easy to knock around (even if it doesn’t break). Its smoother performance is also down to the stronger motor in this one. with it, you can go faster than the Brother (up to 820 stitches per minute), or throttle down for more control. Overall, it’s a much smoother, surer machine. It’s less sensitive and finicky than the Brother and other cheaper options. That can make a big difference in the consistency of your results, especially if you use your machine regularly. A big contributor in that department is Janome’s presser foot design. It automatically adjusts to most differences in texture and thickness, keeping things moving smoothly without bunches or snags. While this feels and acts like a rugged old appliance, it has plenty of modern conveniences. It has snap-on presser feet, a convenient thread-cutter, and a simplified threading feature to make life easier for you. As with the Brother, there’s an automatic bobbin-threader, too. The Janome’s even has an auto-declutch feature to sort out jams all by itself! And, of couse, we haven’t even got to the computer yet! It has an LCD screen and touch-pad controls which give you more buttons to choose from than the Brother. Having a numerical keypad is a huge advantage for getting to your stitches more quickly! The onboard computer has 167 stitches built in, including 5 one-step buttonholes and a full alphabet. The alphabet is a major advantage over the Brother! The font can be sized up to around .25”, perfect for clear labels on personalized projects! You can do both upper and lower case letters, and adjust the font height up to the 1/4” total. Having the alphabet and some adjustments gives you some of the functionality of an embroidery machine without having to buy something overcomplicated. You can actually edit your stitches, as well as making selections between the pre-programmed options. You can get a width up to 7mm, and length to 5mm on any of the options. The Janome also allows you to save up to 50 of your own customized patterns to boot! If you have a signature zig-zag width, for instance, you can set it and come back to it every time without having to make all your adjustments over and over. It’s a smarter computer system, too. That, combined with the larger screen, makes it more helpful than a simple menu system. The Janome actually tells you which foot to use, depending on the stitch settings you choose! It’ll even cross-stitch. There are also a few simple adjustments right on the front of the machine. It has fully-adjustable speed control. That’s via a slider adjustment, much like the one on the Brother. there’s an auto-lock button as well, which neatly ties off all your stitches if you prefer to work that way. Last is the easy reverse button, which is convenient and fairly self-explanatory. One feature we absolutely love on this Janome is the flip-up stitch chart built into the casing. With so many stitches onboard, machines like this either tend to display them all on the front in tiny, illegible font, or don’t display any at all. The Janome’s design totally solves that problem by having a chart that you can flip out when needed, and close when you’ve got what you want. It also gives the whole machine an uncluttered appearance. The Janome’s wider, taller throat make it better for larger projects than the Brother. The droppable feed dogs are ideal for free-motion quilting, too, and it does just fine sewing across pins. It has a built-in bobbin winder which is as easy to use as the Brother’s system. 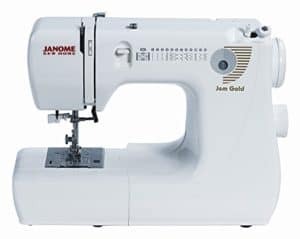 The Janome also has much better automatic tensioning than the Brother, and there’s a manual control knob as well if you find that the self-tensioning bobbin doesn’t get get quite the best setting. That’s a key advantage over the fully-automatic Brother. The Janome also comes with an extremely helpful manual. While you don’t necessarily buy a machine for its manual, a well-written and thorough manual can be the difference between loving and hating any new machine. So, we recommend taking some time to familiarize yourself with the Janome’s, because it really makes your life easier. It’s worlds more reliable than the Brother. The vast majority of the components (especially on the inside) are made of metal. 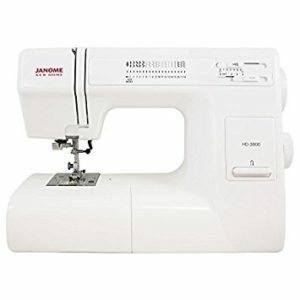 Janome’s also tend to be the sturdiest in this price range generally. In fact, we know of no reliability issues with this model whatsoever! Extended warranties are available as well. We don’t think you’ll need to use one, but it’d be a good thing to have with such a large purchase. It’s not designed especially for beginners. You won’t find any explanatory diagrams on the Janome, the way you would on the Brother. However, as long as you read the manual thoroughly and attend a few classes, this could be a reasonable choice for someone who absolutely knows they’re sticking with sewing. With that said, it’s too heavy and large for most people to bring to classes. It’s nearly 20 pounds all told. So, if you’re thinking of buying this and bringing it to a class or group meeting, be sure you can handle it! You’d also probably want your own dedicated workspace for this one, given that it’s larger and heavier than models like the Brother. This one doesn’t have a push-button start/stop option. It’s only controllable via the foot pedal. It doesn’t come with an extension table. If you want one, you’ll have to buy it separately. If you want full embroidery capabilities, you may want to get something aimed more in that direction. Head to our Embroidery/Monogramming guide for our recommendations! It has an old-school incandescent work light rather than an LED. That’s not a huge qualm, but it’d be nice to see these updated. Thankfully, it’s a standard bulb size, so you can easily fit a brighter and more efficient replacement. It’s expensive. That’s a key reason we don’t recommend it to new needleworkers. You shouldn’t be spending this much on a machine if you’re not absolutely sure you’ll be sticking with it. This is more appropriate for someone who sews on a daily or at least weekly basis. If you’re looking at this model compared to other recent computerized models, it can be tempting to think that the Janome is overpriced or over the hill. We beg to differ. We have yet to find a better midrange model. Sure, other machines have fancier, more modern computer systems or extra features, but they don’t have the Janome’s power or reliability. This is a real workhorse machine, and we think it’s worth paying more for something that will last years than to go for a flashier, lighter model that can give out in half the time. If you want something premium, and don’t mind paying $1000 or so, this Juki is an absolute corker of a sewing machine. It’s for the most passionate home users and the budget-minded professional. We genuinely love this machine, and we think anyone who sews daily will be thrilled with it. It’s that good. You get a spectacular computer system, nearly infinite versatility, and solid build quality, without spending an exorbitant amount of money. This is a seriously powerful sewing machine. It’s faster than the Janome, with speeds adjustable up to 900 per minute! The Juki still gives you plenty of restraint, though. You can turn things down as low as 80 stitches per minute for when you want control. It also has the most pre-programmed stitches onboard: a whopping 625! It has everything the Janome and Brother have and more. There are 4 entire fonts for your lettering and numbering, plus a whole range of decorative and specified stitches. It’s prepared for just about anything, but it’s surprisingly ideal for quilting given that it’s an all-purpose machine. There’s even a complete set of quilting stitches, including super fun “random” stitches when you want a more whimsical approach. This is also the only one of our recommendations that offers hand look quilt stitches And like the other two, you can drop the feed dogs for freestyling. It has all the conveniences you’d expect. It can cut, thread, and wind automatically. All the features work well and reliably. There’s an auto-pilot feature as well, like the one on the Brother. One easy button tells the machine to secure stitches at the start and finish, and to cut automatically when you finish a stitch. You can also cut thread with the pedal or turn the feature off if you don’t like it! As far as working range, the Juki has the same stitch width/length adjustments as the Janome. You can tweak any preset stitch and create banks of your own personal preferences. It’s just as good in terms of build quality, if not better! 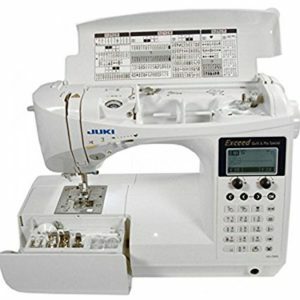 Like the Janome, the Juki has a metal frame and heavy-duty parts all around. Like the Janome, you have a numerical keypad for dialing in specific stitches. There are also 10 commonly-used stitch options marked graphically right on the number keys. You can make length and width adjustments right on the same panel, using little control knobs. The numerical keypad also has telephone-style shortcuts to get to letters. It’s like texting on an older cell phone. As with the Janome’s computer system, the Juki’s displays your stitch, adjustments, and a recommended presser foot. The onboard guides are super easy to navigate, and there are controls on this computer for pretty much every aspect of the machine. You can program the needle positions, so that your up and down switches land at the same place every time. You can also set automatic thread trimming, or turn it off if you prefer to cut manually. You can also program patterns or stitches to sew multiple times in sequence! This display is also more customizable than the ones on the Janome or Brother. It allows you to tweak the contrast rations, change the volume on the alert, and choose from 8 different languages. There’s also a guide right onboard! That’s a great feature for when you have a quick question and don’t want to dig out your user manual. You can make your own combinations of stitches and letters, then save them into the computer. It’s a similar system to the one on the Janome’s computer, only with an extra 20 slots for custom patterns. The Juki also has a neat folder system to sort your custom patterns into categories. The 7-point feed dog system, which is made entirely out of surgical grade steel, makes heavier projects a cinch. It’s an industrial-style design with a box feed method that adjusts to any material or layering by itself, like a souped-up version of the Janome’s foot system. Like our other recommendations, the Juki allows you to adjust the needle position for any manual stitches. The big difference with this model is that you can adjust the needle placement for an entire pattern, without actually affecting the length or width of the pattern you’re using. That also means you can taper zig-zags to the left or right to make appliqué and decorative stitches. It has professional-quality buttonholes pre-programmed. There’s an electronic/automatic attachment with sensors to sew precisely on any material. You can also choose between 16 different buttonhole styles, adjusting width for any of the options. That lets you adjust your buttonholes to find something sturdy and stylish no matter the thickness of the material you’re working with. As with our other recommendations, it’s got a quick-load bobbin system and an independent bobbin-winding feature. You can wind as you sew, and it’s only a two-step process to start each one. And as you’d expect, it threads the needle automatically with a handy lever. The Juki has three different cutting styles for both top and bobbin threads. You can push a button to end a stitch, rock your heel back on the pedal, or program your stitch to end at a preset length. It’s the best of the three for quilting. In addition to all the convenient quilting stitches onboard the computer, you get a very generous 8” x 4.5” throat space. The Juki gives you the biggest workspace to spread wide projects out, too–especially when you consider using the extension table! There’s a great feature which allows you to select a 12mm setting for extra clearance below the foot. It’s little touches like that which make the Juki a real expert’s machine! It has the best work light of the bunch! The Juki has dual LED’s with bright, white bulbs. We have absolutely no complaints when it comes to visibility on this one! It’s very ergonomic. The Juki comes with a knee-lift, and it’s the only one of our picks to have one. You can also adjust the pressure on the pedal so that it responds as you prefer. As a package, the Juki combines a machine with quality above and beyond the Janome with an accessory set that can match the Brother for value! As you’d expect at this price, the Juki’s build quality and quality control are outstanding. The machine is made in China, but it’s inspected and tested in Japan. This is something that will last for years without issue. It’s a fantastic investment! As with the Janome, we aren’t aware of any reliability issues whatsoever with the Juki. It’s the heaviest of the three, at around 21.6 pounds. While that’s certainly not unmanageable for the average person to carry, it’s not very portable for taking to classes. You also can’t store your accessories onboard, so this is by far the least portable of our three recommendations. One of the Juki’s very few shortcomings is that it won’t beep to let you know you’re out of thread in the bobbin. Thankfully, the housing is clear and easy to see. Even our best all-around pick isn’t an amazing embroidery tool. If you’re very interested in elaborate embroidery, you should consider either shelling out for our Ultimate recommendation or buying a secondary machine specifically for your embroidery pieces. So, which of our top three should you buy? The Brother is the clear choice for beginners. It’s the most affordable of the three by a long shot. Plus, it has a big value factor which is hard to ignore when it comes to getting your first machine. This is an ideal machine for you to try a bit of everything when you’re starting out. On the downside, it won’t be most needleworkers’ last machine. The Brother isn’t as versatile and doesn’t have the sturdiness or smoothness of our more expensive picks. We recommend it to newcomers and to experienced folks who just want the basics for occasional projects. If you’re an intermediate to experienced home needleworker, the Janome offers far better durability and smoothness than the Brother. It’s also more versatile, since it has a more well-rounded computer system. There are also lots of features on this model which suit an experienced hand. The manual adjustments on the tension system and the ability to tweak the computer presets offer a lot of personalization and problem-solving latitude. We think this is as much as most home users need to spend. However, if you’re super passionate and work with your machine every day on ambitious projects, it might be worth it to invest in the Juki. The Juki is overkill for all but the most passionate home users, but it’s an outstanding sewing machine by any measure. It’s rugged, reliable, and extremely versatile.We recommend it primarily to professional users. However, if you’re a home user who sits down to sew every day, and wants something you won’t ever grow out of, you’re looking at your perfect machine! The only downside is the price tag, at around $1K. As you’ve seen, we recommended a professional machine that’s very reasonably priced. We think the Juki is a great choice for most paid work, and many folks won’t need to spend any more. However, if you’re looking for the absolute best of the best, and aren’t afraid of a steep price tag, you ought to have a look at this Janome! The MC6500P is an absolute beast of a sewing machine. It’s the needle working equivalent of a supercar. It’s powerful, rock-solid, and smoking fast, with the latest touchscreen tech to help you get more done, faster. This one’s marketed as a “dream machine”, and we can’t really argue with that moniker. It’s more precise than any other machine we’ve reviewed. It also has speeds up to 1000 stitches per minute, which can best nearly anything on the market aside from straight-stitch machines. It has even more throat space than the Juki, lots of quilting features, and all the conveniences you could possibly want. Don’t shell out for this Janome unless you make your money from needlework. If you do, though, it’s utterly fantastic. Of course, some people are looking for something at the complete other end of the spectrum. We think our first Top Three pick is a great value, but we also know that it may be more than some people can afford. Don’t worry! This Brother is even less expensive, and it’s still a capable, reliable machine. The XR3774 is an all-manual machine, but it has enough mechanical presets built in to give you most of the versatility of an inexpensive computerized model. It has 37 built-in stitches and lots of easy manual adjustments. This is enough for anyone to get started and develop excellent technique without spending even $150. You’d be surprised at how reliable it is, too! This is the least expensive full-size model we recommend, but it lasts just as well as the computerized Brother in our Top Three! Given the current popularity of computerized sewing machines, we thought there was no way we couldn’t include them in our Top Three. After all, they’re user-friendly, feature-packed, and that’s definitely the direction in which the market as a whole is heading. However, for those among us (and some of us definitely fall into this camp!) who prefer to do things the old-fashioned, manual way, the Janome Magnolia is an absolute classic. 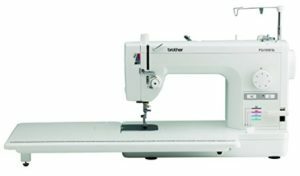 It’s a reasonably-priced machine that gives you the best “traditional” sewing experience on the market right now. We think it’s ideal for newcomers who want to learn proper technique, for old hands who don’t want to have to navigate tricky computer systems, or for instructors looking for something that can easily withstand learning curves. In our opinion, it’s every bit as good as the models in our Top Three! The Magnolia is rock-solid, and will run for years without giving you trouble. You’ll have to do all your adjustments manually, but if that’s your cup of tea, it’s an absolute pleasure to use. These have been on the market for years and continue to be one of our favorites. We also want to point you in the direction of another Magnolia, which is a similar model but with some basic computerized elements included. It’s as sturdy as the 7318, but gives you a few more tricks up your sleeve. As we’ve seen just on this home page, there’s a whole world of options out there when it comes to sewing machines. While things like durability, build quality, and user-friendliness can help us narrow the field in a general way, you’ve still got a wide range of options for high-quality models. The key thing is to figure out which one is the right choice for you. We’ve put together this buying guide to talk you through that process! As with any large purchase, it’s important to be clear about how much you need, want, and can afford to spend on your new workstation. In general, sewing machines cost between $100-$1000. That’s the span of the consumer marketplace, although there are certainly more expensive options for industrial and professional sewing. We’ve mentioned one premium option above, but we want to be clear that very few people need to spend thousands of dollars on a sewing machine these days. In our opinion, only professionals should be spending more than $1500. Even most pros will find that a machine under $1500 can cover their needs handily. We think that beginners, kids, or casual needleworkers who only do occasional projects should plan to spend between $100-$300. That’s enough to get something full-featured and powerful without breaking the bank. However, if you end up sewing a lot and getting more ambitious, you should know that you may eventually outgrow your first $200 machine. Unless you get an all-manual machine in this price range, you should also know that budget options have worse reliability records than more expensive models. Inexpensive computer boards tend to be the worst culprits. Things like plastic internal gears and cheap machining on the sewing components can also go wrong in the long run. Experienced needleworkers will be better off with something in the $300-$600 range. That’s where you start to see better build quality and durability on manual machines, and more of a range of capabilities on computer systems. If you’re branching out and getting ambitious with your projects, these models will serve you much better. You’ll also find that they’re more reliable and durable for daily use. Unless you absolutely know you’re sticking with sewing, these are a bit much for a newcomer to buy, though. If you’re a passionate craftsperson or working professional, $600-$1500 is where you want to set your sights. Obviously, that’s a wide price range in itself. To decide how much you want to spend, you should consider how much income you derive from your work, or how much time you put into your hobby/passion. As we’ve said, the only folks who should be thinking about spending more than $1500 are those who do full-time, high-end stitching, or the most passionate quilters who want a big long-arm setup. Unless you fall into one of those categories, we think you’ll find that one of our $1000-$1500 recommendations will be more than good enough. There are all sorts of sewing machines, even beyond the variety we’ve looked at above. You’ll see all sorts of formats and types on this site, including miniature models and massive long-arm quilting machines. You should start by considering which general type will work best for you. If you’re tight for space or cash, and don’t need a lot of features, mini sewing machines are a convenient choice. They’re super portable, and they’re very affordable. On the other hand, you wouldn’t want to try and quilt on one of these. They’re also nowhere near as rugged or reliable as full-size workhorse models. If you have dedicated workspace and ambitious projects lined up in the quilting department, it makes sense to go with a specifically-designed quilting and sewing machine, rather than a standard sewing machine. Folks who want to do a bit of everything should look for what we’d refer to as a “standard” sewing machine, with a generous but contained table area and a medium-sized arm. The majority of the models we’ve recommended in our guides fall into this category. These machines have enough room and power to do quilting projects (at a smaller scale), and they’re much more versatile than dedicated quilting machines. Knowing about these distinctions can help you narrow down your options as you shop! More than any other distinction, though, the real divide between sewing machine types comes down to computerized systems vs. traditional manual models. Regardless of size or price, you’re going to need to choose whether you want a modern model that has lots of automatic features, or an old-school model which gives you lots of room to make your own tweaks and adjustments. Figure out which you prefer! If you’re all about developing your own technique and skill, you’ll probably want to stick with manual machines. If you’ve got that stuff down pat, you’ll find that machines with some computerized elements will save you time and speed up your work. Beginners can choose either approach: learning the old-school way, or going with a computer model that can do the fiddly work for you. It’s also good to remember that you don’t have to pick strictly between the two worlds! Some models, Janome’s in particular, offer a nice mix of manual and computer controls. 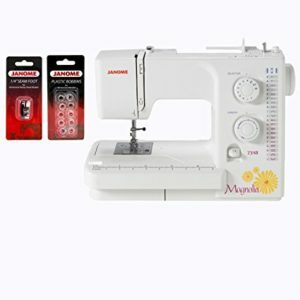 We’ve tried to include a range of options in our recommendations, since we think both computerized and manual machines have their places in today’s sewing world! In any case, computerized machines today aren’t anything like the machines of 10 or even 5 years ago. They’re a lot more intuitive and reliable, as are the automatic features they’re responsible for controlling. If you were put off by an older computerized model, we’d strongly encourage you to give a new model a chance before you decide to write off the whole category! Do you need a wide table for larger projects like quilting? If so, look at a machine with a wider platform on the base, and an extension table out of the box. Quilting on smaller machines can be very frustrating, especially if they aren’t paired with any extensions. Will you be using your machine with an additional table? Building it into a table or desk? If that’s the case, you’ll want to look at a machine with plenty of room to maneuver and measurement markings on the deck, but you won’t need to worry about factory extension tables. What are the size of your projects? If you mainly work on smaller bits and bobs, or do your projects in pieces, you’ll be able to get away with a less bulky workstation. Think about whether it’s more important to have maneuverability or spaciousness. Do you need a free arm, or would you sacrifice that feature to end up with a wide area to spread things out? This one isn’t something everyone needs to consider. However, if it’s important to you, it’s absolutely essential to take care of! First, establish whether you have a dedicated space for sewing. If not, you’re probably going to need to think about how easy your machine will be to pack away when you’re done using it. If you’re going to be keeping it out all the time, you’ll be able to get something heavier and more rugged without worry. Next, think about where you’re going to be sewing. If you’re planning to do all your needlework at home, then portability isn’t super important. For beginners attending classes, you’re going to need to think about things like size, weight, handles and cases. That’s also true for many passionate quilters or sewing club members. Unless you’re planning to have one workhorse machine for home and one lightweight setup for the road, you need your primary machine to be powerful enough for your projects, but portable enough to take with you on the road. Take a careful look at the size and weight of your new machine before you buy, and make sure you know what kinds of case options are available, too. Perhaps more than any other factor, your own personal sewing goals will determine which machine is the best fit for you. Depending on whether you’re looking for a garment workstation or a quilting assembly line, different features and formats will cater to your interest. Think about the projects you plan on doing. Do you do mostly one type of sewing, like quilting? If so, it makes sense to get a model with specific features and design elements to make that easier and more pleasant. Do you want to be able to do a bit of everything? In that case, you’ll want to look for versatility and flexibility rather than for lots of features in one specific area. Once you’ve got a clear mental picture of the kind of needlework you want to get done, you can think about specific features and specs you want. For instance, quilters should get a fixed model with lots of workspace and power, in order to get large projects done more quickly. On the other hand, people who work primarily on garments are better off with a more flexible model that can be adapted to tricky things like sleeves and cuffs. As you mull this over in your head, it’s also a good idea to think about where you are now in your needlework vs. where you want to be in a few years. Are you planning to be improving, or getting more ambitious with your projects? If so, make sure your machine gives you some room to grow! Are you only interested in basic home garment repairs and small projects? Keep it simple, and save yourself some money! Accessories aren’t as important as the primary characteristics of a machine when you’re comparing options. In most cases, you can find extra parts and tools available separately. That makes it easy to expand your kit as you go. With that said, you can save yourself some money up front by buying your machine with a kit up front, or choosing something that comes with lots of extras out of the box. So, think about which extra feet or other accessories you might need for your projects, and then choose a machine or package offer that caters to your own needs. If you don’t find the perfect machine and accessory set, don’t worry! Start by finding the best machine, then simply double-check to make sure there are compatible accessories available for a reasonable price. One thing that became abundantly clear to use when we were creating this home page is that it’s incredibly hard to narrow down the best sewing machines ever. It’s certainly a lot more challenging to pick three models from the whole market to recommend, as opposed to recommending our favorites in a specific category. Even among the very best models, each machine has its strengths and weaknesses. The recommendations we’ve included here on our home page are the best machines we recommend for all-purpose work. They’re good for general mending, DIY projects, and even quilting. They’re well-equipped for everything the average person is likely to deal with in their needlework, but some are better for each type of work than others. With that in mind, we’ve also put together a range of more specific buying guides. We’ve come up with some general categories (quilting, embroidery, heavy duty) that we know folks will be looking for. If you’re looking for something more specific than an all-purpose machine, they’re the best place to look! If you want even more of a computerized approach that the machines we’ve included in our Top Three, check out our dedicated guide! We’ve devoted a whole page to just discussing computerized models. If you sew more in one direction than others, and want something that’s ideally-suited to quilting or embroidery work, check out our more specific picks! Here are all the other guides we’ve put together so far! They’re updated just as often as our homepage, so rest assured that each features the very latest and greatest in the category! It would be impossible to put together a site of sewing machine reviews without devoting at least one page to quilting! It’s a classic pursuit, and dedicated quilters are some of the most demanding users when it comes to sewing machines. Quilts are big projects, and they require lots of workspace, power, and precision in order to achieve heirloom-quality results! We’ve put together a guide just for quilters. Whether you’re approaching your first quilt, or starting on your 100th, there’s a machine here for you! In our guide, we discuss all the features and specs to look for in a quilting machine, and introduce you to our three favorites! It’s a straightforward powerhouse! While this one wouldn’t be as good an all-purpose machine as some of our other recommendations, we don’t think you can beat it for home quilting (unless you want to drop thousands on a long-arm setup). The Brother sews up to 1500 stitches per minute at top speed! That’s some serious productivity for people who make lots of quilts. The PQ isn’t a computerized machine, but it includes a lot of Brother’s great little automatic conveniences, like the needle-threader. It’s rugged and reliable. Perfect for the passionate home quilter with some serious yardage to cover! 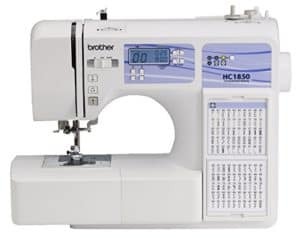 Read our full review of the Brother PQ1500SL, and check out our other quilting recommendations here! When even machines like the Brother PQ1500SL aren’t enough, the most ardent quilters turn to long-arm setups. These are big beasts of sewing machines, and they require the most space and money of any type of equipment! We don’t recommend long-arm quilting machines to most people, simply because they’re such a massive investment. However, if you’re a professional quilter or competitive hobbyist, they can pay for themselves over time thanks to their efficiency and sheer size. The Juki is a sit-down format machine, with a very respectable 35” width. Even if you’re coming from a dedicated quilting machine, that’s a serious increase over tabletop workspace! This one comes with a table and a stand in the package, and you can adjust the height from 30-34”. In terms of machinery, the computer system and hardware on this model are as good as it gets. You can use it in a stationary format out of the box, or grab a Juki sliding frame to use it as a more traditional long-arm system. However you set it up, the Juki provides the passionate quilter with everything they could possibly want. 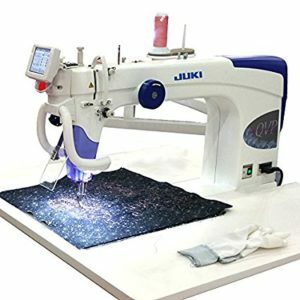 Check out our full review of the Juki, see our other picks for long-arm quilting machines, and learn whether you should be considering one in our special guide! Sewing is many things to many people. It’s a relaxing, productive hobby for casual needleworkers. It’s a great way for the thrifty person to save money by repairing clothes and furnishings. For many, it’s a career in itself! Regardless of what you want to do with your new sewing skills, we want to welcome each and every beginner! The sewing, quilting, and embroidery world is one of the best communities you can join, and you’ll find that your fellow enthusiasts and experts are always happy to share tips, tricks, and patterns! We’ve put together a guide that we think beginners will find extremely helpful. In it, we break down exactly what you should and shouldn’t spend your money on when you’re starting out. Our guide gives you lots of options for learning both manual and computerized machines, and helps you decide which one is the best choice for you! It’s an affordable classic that’s never gone out of fashion! This model is one of our all-time favorites, and it’s saying something that after years and years of new models being offered, we keep going back to the 2212. If you like an all-manual, old-school machine, this is absolutely ideal. The Janome has simple manual adjustments, and you can tweak all the settings by hand. With a lot of computerized models, you’re stuck with going to a dealer if you can’t get automatic features like the tensioner to work just right. This will teach you how to get a machine sewing straight and neat without any help from technicians or motherboards! Even though it’s straightforward, there are still plenty of conveniences! This one has twelve built-in stitches, as well as a simplified button hole feature. It has a free-arm for flexibility, and adjustable stitch length with a handy dial. So, while the Janome is a manual system, it’s still user-friendly. Read our in-depth review of the 2212, and have a look through our other recommendations for new needleworkers here! Embroidery and monogramming are some of the most fun things you can do with a sewing machine. They’re notoriously tricky to get right with your average sewing machine, though. We’ve rounded up a few models which are perfect for detail-oriented folks to solve that problem! Our recommendations have intuitive, versatile computer systems to help you easily start and finish any design you have in mind. This is a fantastic computerized sewing machine that’s been designed specifically for embroidery and monogramming! It has touch-screen navigation, 138 built-in designs to choose from, and a USB port to add even more. You get 7 different fonts to play around with, too! Best of all is the generous 5”x7” embroidery area. It’s packed with lots of convenient features that make it more pleasant to use than other embroidery machines, too! There’s a bright work-light, an automatic needle-threading system, and a jam-resistant bobbin loader. We also like that this one works with any standard embroidery files, not just Brother’s proprietary formats. That means you can get designs from practically anywhere, including free libraries! Anything within a 5×7 square is fair game. And, of course, it’s a capable workhorse machine in its own right. We think this is a much better buy than an embroidery-only model, since it can help you with your construction as well as your detail work. To read our full review of the Brother, and to compare it with our other embroidery/monogramming recommendations, head over to our special guide! When ruggedness is the name of the game, you can’t beat a heavy duty sewing machine. Heavy-duty machines have lots of metal parts, high duty ratings, and outstanding build quality. These are what we’d recommend to anyone who’s shopping for a workhorse to go in a classroom or educational setting. They’re also an affordable option for theatre companies and other users who need to do lots of work and need something more durable than your average machine. The problem these days is that a lot of models are marketed as “heavy-duty” when they clearly shouldn’t be. We’ve sorted the real workhorses out from the pack in a dedicated guide! You can see our Top Three recommendations, and see how they compare to our general picks in construction and reliability. 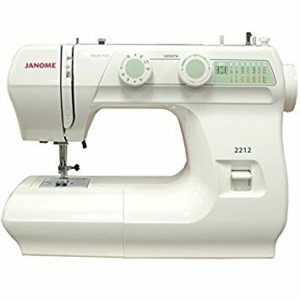 In fact, Janome is one of the best companies to go with when it comes to reliability and durability. While their machines aren’t as jam-packed with features and conveniences as Brother’s, they tend to last much longer. Case-in-point: the HD3000! It’s essentially a bulked-up version of the 2212 we’ve recommended above. The HD3000 is an all-manual machine with no computerized parts or gadgets at all. It’s rugged as heck! We think this is miles better than the competition from Singer or other companies at this price. The Janome has an aluminum body, and a heavy-duty metal frame. It’s lighter than other heavy-duty models without feeling any less solid. One of the big reasons we think this is the best in its price bracket is the fact that it’s every bit as user-friendly as the less heavy Janome’s. It has front-mounted adjustment knobs for the stitch length and width, along with 18 built-in stitches and a one-step buttonhole feature. Read more about the Janome HD3000 in our in-depth review, or have a look at our other heavy-duty recommendations here! If you have a child in your life who’s getting into sewing, you should be excited! Sewing is a great way for kids to unlock creativity and learn problem-solving skills. Plus, who wouldn’t want a kid who can hem their own pants? The tricky thing to navigate is guiding a child through their first sewing experiences without them getting too discouraged or frustrated. You need to find a machine that can handle a learning curve, keep little fingers safe, and build skills which translate to a full sewing machine when your child is ready. There’s also the added pitfall posed by the fact that so many kid-branded models aren’t proper sewing machines at all. They’re gimmicky toys which won’t last long or help your kids produce satisfying results. Don’t worry! We’ve put together a few choices that we think are perfect for little needleworkers. There are some computerized models for kids who want to jump right into creating without bothering with technique, and plenty of manual models as well, so kids can learn the same way you did. This Hello-Kitty model might look a bit like a toy, but believe us–it’s the real deal! The Janome is all manual, so you can teach real techniques on it. Thanks to the built-in stitches, though, there’s enough for kids to play around without getting bored. 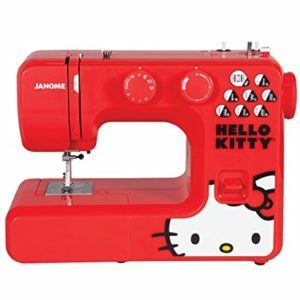 The Janome also sports fantastic build quality for a machine that’s made for young ones. It has an internal aluminum frame which can stand up to the learning curve with no issues. It also has some nice kid-friendly features, like a lower top speed and snap-on presser feet. All the built-in stitches have enlarged graphics on the front of the body. That’s all on a full-size body which won’t leave kids struggling when they graduate to an adult machine. You can find out more about the Janome, or see some other options for kids who want computer assistance and more extra features in our dedicated guide! Sewing leather is the absolute nemesis of most machines. It’s one of the toughest materials you can use, and it can wreak havoc on all the components on your machine. It’ll snap needles that aren’t made for it, and snap plastic internal gears as well. If you want to work with leather properly, you’ll have to read our guide! It goes into the important of power, precision, and adjustability when you’re working with hide materials. We’ll also talk you through finding the proper needles and feet for leatherwork. And, of course, we’ve chosen a few machines that excel with leathers! One total trooper with leather is the Janome Magnolia 7318. You’ve already been introduced to it above. It’s our top all-around pick for folks who like to keep it simple and stick to manual adjustments. The Magnolia has any number of fantastic features, but its superb performance on leather is down to a few key ones. First, it’s sturdy through and through. This machine as a whole has no problem going through layered denim, leather, or canvas. With many at this price, you’ll be left with a rickety, imprecise machine at best. Not the Magnolia! It goes through leather like butter, and if you get it with the deluxe accessory set, you’ll have the proper foot and needle out of the box. It has a powerful motor, reliable internals, and manual tension adjustment to keep leather moving smoothly. We’ve written an entire in-depth review of the Magnolia in the context of leatherwork. You can read that, and see our other picks in our Leather guide here! Computers are by far the biggest thing to happen to sewing since, well, sewing machines. Seriously. They’ve changed the game singlehandedly, and transformed the way most needleworkers operate. Nowadays, it’s actually becoming less common to learn manually, since these machines offer easy shortcuts through most of the things we’ve had to struggle to perfect before we could start creating at our machines. 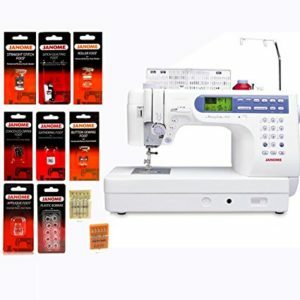 Whether you’re looking for the easiest way into your first sewing projects, or you’re an experienced sewist who wants to take some shortcuts to get more done, computerized sewing machines are worth a look. We’ve included several on this page in our Top Three, since that’s what most people are interested in when they go about getting a brand new sewing machine. However, we though it would be important to give you even more of a sense of your options for computerized equipment. So, we wrote an entire guide to computerized sewing machines! The Brother is a shining example of the modern sewing machine. It’s affordable, easy to use, and packed with features. While there are countless automatic features and conveniences on this model, you still get sturdy build quality and lots of metal parts. With 130 built-in stitches and pre-programmed monogramming font, you can do anything from construction to basic finish work on the Brother. Plus, it even comes with a wide table extension and specific quilting features/stitches for big projects! This would be a very capable choice for ambitious beginners, or for frugal home needleworkers who want the most bang for their buck. See everything we have to say about the Brother, and have a look at the rest of our computerized picks here! If you’re a beginner who wants to attend sewing classes, or a passionate hobbyist who goes to quilting or needlework clubs, mini sewing machines are your best friends! They’re portable, simple, and fun. A lot of miniature and compact machines aren’t very good, though. They have very limited functionality, and in most cases, the functions that they do have don’t work well. Plus, they sacrifice build quality for portability. In our special guide to mini sewing machines, we’ll introduce you to three models which pack all the features and quality aspects we look for in full-size machines into a smaller package! It’s a very tidy little package, and easy to transport to sewing class or a needlework group. The Jem weighs just about 13.5 pounds with accessories and the case included. The biggest advantage this has over the competition in its size/price class is its ruggedness. This isn’t a heavy-duty machine, but it’s far sturdier than an equivalent Brother or Singer. You’ll find that you get a much better working life from the Jem than other mini options! 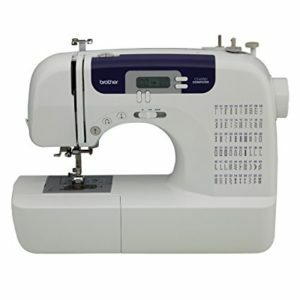 This might not be the most versatile machine on the market, but it’s sturdy and does any basic stitching well. You get 12 built-in stitches, and a choice of snap-on feet for working on various materials. The Jem has a worklight, adjustable stitching, and automatic thread cutting just like the full-size Janome’s. We think you’ll be pleasantly surprised by how much mileage you can get out of such a small machine! It’s even capable enough to do mobile quilting with friends!